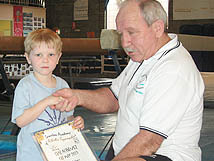 The Academy provides Artistic gymnastic programs for children aged 2½ to 5 years and also for children of school age. Prospective students commence with a paid two (2) lesson introductory course to decide if they enjoy the sport. This introductory course also provides us with the opportunity to assess your child & position them into a class of appropriate age & ability grouping. After this 2 lesson introductory period if the student chooses to continue, Annual Registration fees, Support Group levies and Lesson Fees for the balance of the current term must be paid. All fees are payable in advance. Please refer to the "Fees" section on this web site. Gymnastics is a year-round sport, not seasonal like many other sporting pursuits. Beginners can commence at any time of year. Our program operates on 6 terms per year of approximately 8 lessons in duration. Classes are conducted on all school holidays with the exception of the Christmas period where we are closed for 4 weeks. Classes are not conducted on the following public holidays - Australia Day, Good Friday, Easter Saturday, Easter Monday, Anzac Day, Labour Day, Queen's Birthday and Exhibition Monday. Classes are conducted as per usual on all school "Pupil Free Days". In the majority of Academy classes the coach to gymnast maximum ratio is 1 : 10. In our Girls & Boys 5 – 6 years beginner program & Pre-Prep Flyer girls & boys our coach to gymnast ratio is generally 1 : 8. Accredited Assistant Coaches (volunteers and paid employee’s) and Gym Leaders (volunteers) are also utilised to assist our resident staff in their duties and provide valuable feedback and assistance with group management. Tiny Twister gym is a place where children are given the opportunity to explore & develop their physical potential before going to school. It is a non-competitive program aimed at supporting & improving your child's motor skills and self confidence in relation to body management. A fun & safe environment is provided so children can learn to develop independence and gain new skills at their own pace. Fun, Fitness & Friendship is the underlying philosophy of the program. Note:- weekday afternoon classes & Saturday Morning classes are available for children attending full time Prep Year. Recreational classes for Beginners aged 5 - 12 years are conducted on weekday afternoons and Saturday mornings. Children aged 5 - 9 years generally commence with a 1 hour lesson per week. Children 9 - 12 years generally commence with a 2 hour per week class. Gymnast's with previous gymnastics experience are offered a "free" assessment class to provide us with the opportunity to assess your child & position them into a class of appropriate age & ability grouping. They then complete a 2 lesson introductory term before paying fees as mentioned above. The Lawnton Academy recognises a clear distinction between Recreational and Competitive gymnastics. Most children will enter in the Academy Program via the Recreational Program. From this program gymnasts are selected for our Competitive Program via talent spotting by the coaching staff. It must not be perceived that there exists a difference in technique, quality, training method or level of physical preparation required between the Recreational & Competitive programs. The only difference is in the number of years taken to achieve a particular skill, as a function to the number of hours devoted to training on a weekly basis. Each gymnast, irrespective of which program they are involved in, is considered a unique individual with a unique potential.